Oliver Williams was born in Roxbury, Massachusetts, a village near Boston, in 1774. Undoubtedly, he grew up aware of, and hearing stories about, the birth of his young nation. Oliver Williams later saw opportunity in the vast Northwest Territory. He opened a dry goods store in Detroit, Michigan Territory, in 1808. The inventory for his store, like nearly all finished goods, came from the east. He made two trips each year, overland. The trips were slow and the resources he expended were never anything more than a continuing drain against whatever profits early businesses in the cash starved frontier would permit. In 1810, Oliver Williams took a chance. The gamble was not particularly unusual for men of his nature. Men did not conduct business on the frontier without an entrepreneurial instinct. He decided to build a ship. The vessel would use the only "highway" available – Lake Erie; Buffalo to Detroit, non-stop, direct. His inventory would arrive faster, and in greater quantity, and while the vessel was a substantial capital outlay, she would sail for years and could earn money by shipping goods the length of each shipping season. Other vessels plying the Lakes were finding cargoes and the steady stream of settlers assured volumes of cargo and demand for the ship would only grow with each coming season. Oliver Williams built his ship at the River Rouge, on the banks of the Detroit River. A private shipyard was laid out adjacent to the Federal yard, where the army transport snow Adams, the only government vessel on the upper Lakes, was built years before. Other ships sailed past while this new vessel took shape, the schooners Salina and Ellen and the sloop Contractor. The sight of each of them only encouraged Oliver Williams. His idea had merit; his gamble would pay. The new ship slid down the ways, in early 1811. He christened her Friends Good Will. While no one knows for certain the origin of the name, a coincidence seems too obvious to ignore. The name may well have been in honor of an earlier Friends Good Will, which transported the first wave of Irish immigrants from Larne to Boston in 1717. It is likely Oliver Williams knew her story and borrowed her name. His vessel, he likely hoped, would also bring waves of settlers to a new land of opportunity ­ the Michigan Territory. At 47 tonnes burthen, the square topsail sloop carried cargo for her owner and others, paying her way in settling the new frontier. Oliver Williams retained an experienced Master, William Lee, formerly Master of Contractor, to operate and protect his new investment and avoid the numerous risks endemic to navigating the Great Lakes. The gamble was paying off. The reported tensions with England and the Royal Navy on the high seas seemed, at most, a distant storm largely irrelevant to their present course. On June 19, 1812, Friends Good Will departed Detroit, bound for Mackinac Island. Oliver Williams had agreed, upon his arrival at the Island, to charter Friends Good Will to the Federal Government for carrying military stores and supplies to Fort Dearborn at Chicago. He decided to ship aboard for this voyage. In Detroit, William Lee loaded 304 separate items into the hold of Friends Good Will, all intended for Mackinac Island. Fortunately, the original manifest of that voyage survives, bearing the signature of her Master, William Lee, the Port of Detroit customs agent, a description of the vessel and a very detailed description of the cargo: tobacco, whiskey, wines, and other goods bound for the upper Lakes. At Mackinac, Friends Good Will offloaded her cargo, took on military stores, supplies and soldiers to protect from the possibility of hostile natives. The rumors of war were more prevalent and troubling. Still, the issues between Washington and London seemed a long way off. Of more immediate concern was navigating the shoals, avoiding the islands and the mid-summer thunderstorms that could endanger any down-bound vessel on what was then a very remote Lake Michigan; all of course before lighthouses or any hope for assistance from others. Fort Dearborn (Chicago) was in many ways the far edge of the Northwest Territorial Frontier. Friends Good Will brought "news," now months old ­ but received none. By the time the northbound sloop was hull up, with the Fort Mackinaw ramparts visible from the cross-trees, it had been out of contact with interests in Detroit for some weeks. Still, the lookout clearly made out the Stars-and-Stripes flying over the Fort. A brief stop, then on to Detroit. Oliver Williams, William Lee and the crew could not have been more surprised when on July 17, 1812, upon their return to Mackinac Island they were informed, at gunpoint, that they were now on English soil. The American flag had been a ruse to lure American shipping into the harbor. War had been declared, unbeknownst to Friends Good Will or the Fort Mackinac garrison. The island had fallen without a shot and Friends Good Will, in no position to resist, was confiscated as a prize-of-war. Oliver Williams likely protested, as his was a private vessel. But her business in Lake Michigan, from which she was just returning, was military in nature, ­ a strong enough argument for capture given the distance from the Admiralty prize courts. Oliver Williams, William Lee, and all passengers and crew were taken prisoners of war. 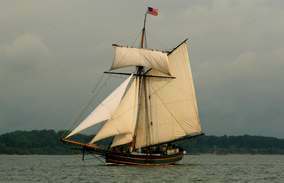 They were paroled and transported back to Detroit aboard the schooner, Salina, with Daniel Dobbins, Owner and Master. Worse yet, from the perspective of Oliver Williams and William Lee, Friends Good Will was taken into the service, renamed Little Belt, and became a part of the Royal Naval Squadron on the upper Lakes. She was armed with a pair of six-pounders and a nine-pounder on a pivot; serious business for a mere sloop. Suddenly, the gamble had gone terribly wrong. Politics and the balance of power formulated half-a-world away had swept in like a Great Lakes mid-summer cold front. With the loss of his ship and its cargo, and with himself a prisoner, even an optimist like Oliver Williams had to admit his grand business plan was in tatters, like so much storm ravaged canvas hanging from the yard. 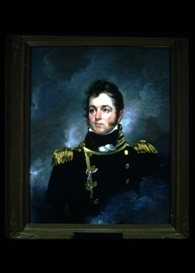 Lieutenant John F. Breman, Provincial Marine, likely spent the summer of 1813 wholly impatient with the state of affairs on the Upper Great Lakes. He was, after all, fully prepared to bring the full weight of his broadsides against the King's enemies--all 15 pounds of it! While hardly impressive by the standards of Trafalgar, or any real naval engagement, still H.M. Sloop Little Belt was nearly new, well found and ready to cruise for American prizes. If only the Royal Naval Squadron Commander Robert Barclay would permit his separation from the mundane duties of patrol and dispatch, he was confident that his command, the former Friends Good Will, could sweep Lakes Michigan and Huron of all remaining American vessels. Breman likely made his plea to Barclay at the squadron headquarters at Amherstburg, across the river to the south of Detroit. His eloquence, he feared, had not been fully appreciated. Barclay, a veteran of Trafalgar, probably seemed distracted and dismissed his plea with the simple logic of an experienced career officer in the finest navy in the world ­ there were simply few if any American vessels, merchant or government, remaining on the Upper Lakes. Barclay saw the larger picture. "Mr. Madison's War" had opened disastrously for the Americans on the Great Lakes. Despite the obvious advantage of Americans being able to prepare themselves before they declared war, such foresight was inexplicably lacking in the Northwest Territory. The fall of Fort Mackinaw in July 1812, a strategic choke point of transportation and commerce, followed the declaration of war by less then one month. By August 1812, the British, together with native allies, attacked and burned Fort Dearborn, Chicago and marched survivors into the woods of Illinois never to be heard from again. Indeed, Friends Good Will may very well have been the last ship to put into Chicago before the bloodshed and she brought no news of any declared war. Lake Michigan was, once again, in the firm control of the English Crown. Lake Huron was likewise undisputed. Worse still, General Hull surrendered Detroit without a shot and to a dramatically smaller force, also in August 1812. With Forts Detroit, Mackinaw and Dearborn flying the Union Jack, all within 60 days after war was declared, the United States had little credible claim to the vast Northwest Territory. Precisely because of these early victories, Lieutenant Breman could not fathom Barclay's concern. Barclay knew, however, that the Americans were attempting to build an entire fleet at Erie. Blockading the new ships in port would at least deprive the Americans of any opportunity to train and acquire the skills necessary to fight at sea. The Royal Navy had for years dominated the French with precisely this tactic. H.M.S. Shannon similarly benefited in her conflict with U.S.S. Chesapeake, despite the dying words of Captain Lawrence, "Don't give up the ship." Consequently, through much of the summer of 1813, British ships tacked back and forth across the entrance to Erie Harbor. There would be no independent cruise for Little Belt. Meanwhile, the United States Navy dispatched Lieutenant Oliver Hazard Perry, U.S.N, of Newport, Rhode Island, west to its inland seas. 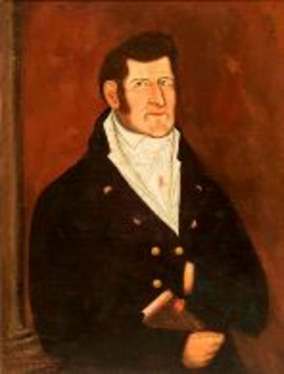 Equally important, the Navy dispatched Noah Brown, an accomplished ship builder from New York to Erie, with a crew of carpenters and shipwrights. Combined with efforts already underway at Erie, notably by Daniel Dobbins, formerly of Salina, an American squadron began to form. The logistics were a nightmare. The outcome could well depend upon supplies and provisions. Time was of the essence. While the American supply routes were poor, the British faced far worse. England, after all, was already engaged in world war -- a long-term struggle to the very death of competing empires. Little was spared by the Royal Navy for a decisive conflict upon an inland lake. Hence, Barclay was more than distracted; his concern was well founded. He was, quite simply, ill equipped and poorly supplied. Still, or perhaps precisely because of these dynamics, no one can explain why in late July 1813, Barclay simply sailed his squadron away from Erie. Perhaps his provisions were low. Perhaps he felt the American squadron would not be ready to sail that season. Perhaps he feared they would. In any case, Perry beheld an empty horizon to the north and seized the opportunity. He put out with his squadron immediately so to gain valuable time training on the water. He commented to Brown, who was concerned about the hasty workmanship. "We want no extras; plain work is all that is required; they will be wanted for only one battle; if we win, that is all that is wanted of them, if the enemy are victorious, the work is good enough to be captured." He understood. It would be all or nothing. The squadrons were relatively equal in guns and men. The Americans had 54 cannons, the British 63, including Little Belt's 3! The Americans held an advantage in the ratio of regular naval crew, but the British had far more time on the lake for training. Perry proceeded to Western Lake Erie and waited near South Bass Island. He raised his flag in a new brig, Lawrence, and flew a banner from atop the mainmast, "Don't give up the ship." Barclay would get wind of his location. Lieutenant Breman, deprived of his independent cruise, would nonetheless by mid-September take his new command, Little Belt, into action. On September 10, 1813, the British squadron was sighted approaching from the northwest. The wind was light. Perry weighed anchor and proceeded to form a line. His two largest vessels, the Brigs Lawrence and Niagara, were to engage their British counterparts and support one another. On the British line, Little Belt was last but, with a nine-pounder on a swivel, was confident of joining in the fray. Lawrence engaged aggressively, eventually using both sides. The destruction was horrific. Meanwhile, inexplicably, Commander Jesse Elliott, U.S.N., of Niagara, failed to close or engage. After more than two hours of fierce close-range fighting, Lawrence was rendered unmanageable. Near the end of her service, Perry himself was said to be fighting one of the great guns. Perry eventually boarded a ships' boat, and with a small group of survivors transferred his flag to Niagara, immediately relieving Elliott of command. Despite the carnage aboard Lawrence, she apparently gave at least as well as she got. Perry managed to maneuver Niagara amidst the damaged British vessels and after engaging from both sides, the Union Jacks came fluttering down. Little Belt stood off, filled away and attempted escape. Lieutenant Breman, although probably unaware, was the only uninjured captain throughout the entire British squadron. In the light wind, the chase unfolded slowly, but if he could somehow stay out of range until dark, Little Belt might just slip back to Amherstberg. But it was not to be. Little Belt was launched flying American colors and was destined to do so again. Before nightfall she fell within range of the schooner Scorpion's heavier guns. Lieutenant Breman hauled down the Union Jack, making Perry's victory complete. Soon after the great guns fell silent, Commodore Perry penned his now famous dispatch, "We have met the enemy and they are ours: Two ships, two brigs, one schooner and a sloop." That sloop was Friends Good Will. Our heroic Perry has turn'd fortune's tide. May our country long nourish the liberty tree! To this day, the battle remains the only time the Royal Navy has lost an entire squadron. More than heartening an uncertain young nation, however, the Battle of Lake Erie has a special significance to Michigan. But for the outcome, Michiganders would have flown first the Union Jack and years later the red maple leaf of Canada. While most are familiar with Perry's first dispatch to General Harrison, a more detailed report dashed off that same day to Secretary of the Navy William Jones is, although less famous, just as profound: "It has pleased the Almighty to give the arms of the United States a signal victory over their enemies on this lake." That signal victory caused English subjects watching the horizon from the shores of Ontario a great deal of confusion, leading to apprehension. The great guns had been heard all afternoon from Cleveland to Detroit. When the locals saw Little Belt leading ships toward Amherstberg, yet flying the Union Jack, they first assumed their victorious squadron was returning. To their horror, the Jack fluttered down, the ships turned south and the realization swept over the onlookers that husbands, fathers, brothers, and friends would not be coming home for some time, if at all. More slowly they came to appreciate the implications of Lake Erie devoid of the Royal Navy. Their homes were vulnerable. Even the cannon from Fort Malden had been removed to arm H.M.S. Detroit. Those guns, so recently piercing Fort Malden's ramparts, were now in American hands. Perry wasted no time. Even as he was rowed back to the shattered Lawrence, he likely considered the very purpose of securing Lake Erie; an invasion of southern Ontario. As his ships, many jury-rigged, limped back to South Bass Island from whence they weighed anchor earlier (was it just that morning? ), he considered the season; mid-autumn and how little time remained to begin an entire campaign. But first there were honors to extend and obligations to fulfill. Arthur O'Keefe, of the 41st Foot, representing the stricken Commodore Barclay, boarded Lawrence and offered Perry his sword, hilt first. Perry refused and informed the British officers that as honorable adversaries they may keep their side arms. Thinking Barclay was mortally wounded, Perry paid him a visit aboard Detroit. Thomas Breese of Lawrence read the burial service from the Book of Common Prayer and all too many heroes wrapped in canvas slid over the side from underneath two different flags; both red, white and blue. As the prize crew on Little Belt struck 8 bells, marking midnight and the change of the watch, she put into South Bass Island with Scorpion keeping a close eye. She now joined the combined squadron and added to the prisoners that already outnumbered the captors. For the last time on Little Belt, the Union Jack was hauled down; although the Stars and Stripes were on this occasion flying above those British colors. The next morning, Perry shifted his flag to Ariel, a mere schooner of only 4 guns. The move spoke volumes as to what a difference a day made. Perry no longer needed a powerful brig. There were no more opponents afloat on Lake Erie. He needed the speed of a nimble schooner and with all dispatch he acted to advise General Harrison, whose purpose he was primarily ordered to assist at every opportunity. Harrison's army had, in the hopes of the Navy delivering "a signal victory," prepared numerous bateaux and organized themselves to be transported across Lake Erie. Harrison, no sailor, envisioned cramming men, horses, feed, provisions, and cannon on the available ships and crossing in a single trip. Perry cautioned that "staging" was a far more prudent approach, leaving room enough on deck to fight the ships and cover the landings with naval artillery should the opposition Harrison expected materialize. Harrison deferred and was later very complimentary of Perry's advice and support. While Perry's ships chased a few remaining British vessels off of Lake St. Clair, he prepared to lead a very rare and complex amphibious assault from the Portage River (what is now Port Clinton, Ohio) to south of Fort Malden across Lake Erie. On 22 September 1813, less than two weeks from the date of Perry's signal victory, Little Belt, together with other ships in the squadron, began transporting a 3500 man army, with as many as 90 landing craft, to Middle Sister Island about 15 miles off shore of Fort Malden. The entire invasion force assembled on that island of only a few acres. On 27 September, Little Belt crammed its hold and deck with soldiers and arms and while towing several bateaux, landed portions of Harrison's army, surprisingly unopposed. While covering the landing with their deck guns, the smaller vessels, among them Little Belt, scared off natives observing the operation. Though not exactly D-Day, the operation was historic and a tremendous success. Seldom before had independent branches of the United States military coordinated an assault so complex and fraught with risk. Harrison was extremely pleased with Perry's inland navy. The operation in which Little Belt played an active part served as a shining example for military training for years to come. Meanwhile, things were not going well for the British. Their important native ally leader, Tecumseh, was furious at the thought of a British withdrawal. He made his feelings known at Amherstberg in such strong language that the attending British officers were fearful their native allies were threatening violence upon the King's representatives. Still Amherstberg, Sandwich (now Windsor), and Detroit were wholly untenable. The British fell back and Detroit was freed from British occupation. The British retreated up the Thames river valley but Harrison caught them on 5 October. The Americans, with far superior numbers, decisively won-the-day and significantly, Tecumseh was killed in the battle. The invasion of southern Ontario was a success. For the balance of the war, major portions of the Northwest Territory were again secure. Little Belt continued her service in the United States Navy through that sailing season. Additional research is underway hoping to uncover more details. Perry was informed in a letter sent from Erie dated 1 November, that Little Belt "was high and dry." Some sources credit a major storm as driving her ashore just south of Buffalo. Apparently the damage, if any, was slight enough to warrant several unsuccessful efforts to re-float the sloop. Unfortunately, on 31 December as the new year unfolded, a British force raided Buffalo and drove defenders scurrying east not to return for some weeks. The British burned the village and Little Belt, still aground, was also set ablaze.